Earlier this year we designed a custom Arabic font for the new BBC Arabic TV channel. 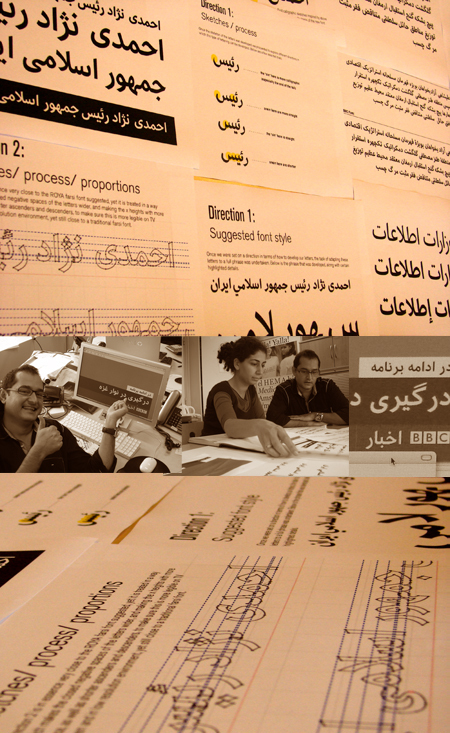 A similar yet different project came our way afterwards at Tarek Atrissi Design: Designing a unique Farsi font for the new BBC Farsi TV channel, which will officially start broadcasting later this year. Above: Preview of the Persian font designed for BBC Farsi, and a preview of its on-screen usage. Despite dealing with a similar script; and with the same client, the recent Farsi type design project took a very different path from the previous Arabic type project. Certainly, we learned from the process of the Arabic font: Learned more on the process of work with BBC; on the testing and technical issues accompanying the project; and on the context in which the font will be used and the goals it wanted to achieve. We also learned from the simple experience of watching BBC Arabic today, and seeing the outcome of our work “in use” in the daily news reporting. All this of course affected our approach to this similar project, and made us work on it with a supportive experience. Most important, the brief given to us by the Persian Editorial team was very different from the brief of BBC Arabic, if not opposite. 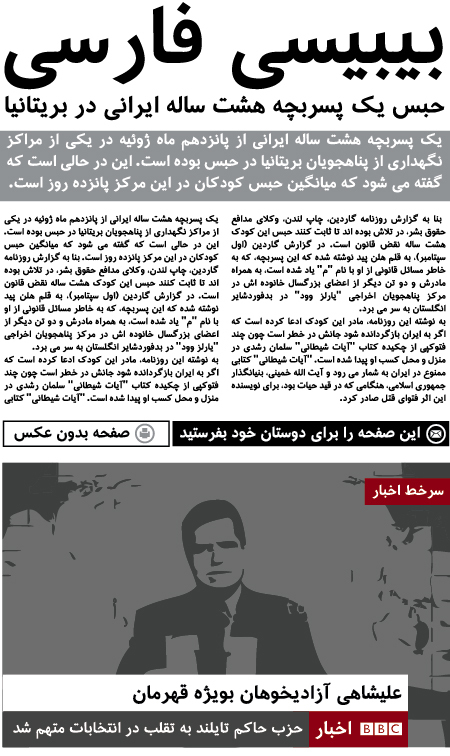 The unique font that was required to be developed for BBC Farsi needed to be “subtle”, not visually imposing or with a strong character and being hence “transparent” to the reader and not calling undue attention to it. It needed then to follow the traditional and commonly used Farsi Typefaces in Iran, for it not be a visible and strong change of type style for the average viewer. The typeface still needed to look modern however, despite being inspired from the traditional. It needed to be designed to address a better legibility, particularly on screen resolution, and to work smoothly with the on-screen layout and information design of the new channel, particularly with relatively short ascenders and descenders. The result is a new low contrast typeface with a contemporary look and feel and with open counters; optimized for best usage on TV screen; A typeface supporting Arabic and Persian languages, and ideal for usage for good legibility and a subtle modern character. The font is not exclusive for BBC and hence will be take a life on its own, beyond its life on the Farsi News Screen. Details on licensing this typeface will follow shortly.